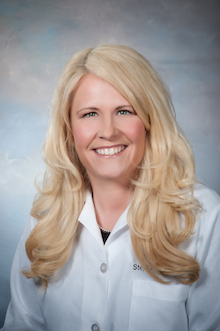 Stephanie B. Herndon, NP | Gastrointestinal Specialists, Inc.
Stephanie Herndon has been an Acute Care Nurse Practitioner since 2004. She has worked in gastroenterology since 2011 and joined GSI in 2014. She works closely with Drs. Michael Farrell, William Brand, and Ben Bradenham at both the Henrico Doctor’s Forest and Parham Doctor’s Hospital locations, seeing both office patients and inpatients. Stephanie received both her undergraduate and master’s degrees from Virginia Commonwealth University. Prior to discovering her passion for gastroenterology, she worked as a nurse practitioner in various other areas, including pain management, occupational health, and interventional radiology. Before becoming a nurse practitioner, she spent 3 years as a registered nurse in the emergency room at Henrico Doctor’s Forest, where she gained great experience in the care of acutely ill patients. She is a member of the Virginia Council of Nurse Practitioners and the American Academy of Nurse Practitioners and has served as a preceptor for the School of Nursing at Virginia Commonwealth University. Born and raised in Richmond, Stephanie is the proud mother of one boy. In her free time, she enjoys shopping, reading, listening to music, cooking/baking, and spending time with her family.